The Visitation Institute Speaker Series brings together top scholars and speakers from around the area and beyond to share their expertise based around a particular theme. Stay tuned for updates for the 2018-19 Academic Year! Each January, the Visitation Institute offers and in-depth study of one or more of the books of the Holy Bible. This study is led by Fr. Peter and Josh Dieterich along with the occasional guest lecturer. It is a wonderful opportunity to dive deeper into God's Word while growing in fellowship with other parishioners. The 2019 study will begin in January and cover The Book of Hebrews. Each year, the parish offers two book studies, one in the Fall and one in the Spring, to dive more deeply into the great works of Theology and Spirituality. In the Fall we study a classic book of Catholic thought/spirituality, and in the Spring a contemporary one. TEach January, the Visitation Institute offers and in-depth study of one or more of the books of the Holy Bible. This study is led by Fr. Peter and Josh Dieterich along with the occasional guest lecturer. It is a wonderful opportunity to dive deeper into God's Word while growing in fellowship with other parishioners. Consider joining us as we explore the wonderful history of our Catholic Faith. We currently offer three classes, all taught be wonderful catechists and scholars. "Intro to the Early Church" (w/ Mike Creegan), "Going Deeper with the Church Fathers" (w/ Fr. John Gibson), and "Intro to the Medieval Church" (w/ Josh Dieterich). Keep an eye open for upcoming dates and times for 2018-19! St. Mary's Visitation Parish is excited to invite you to join us for her 2019 Lenten Parish Mission, March 11-12th, 2019, with world-renowned Scripture scholar, author, and Catholic Convert Dr. John Bergsma! Dr. Bergsma is currently Professor of Theology at Franciscan University in Steubenville, OH, where he lives with his wife and 8 children. He is a prolific writer, presenter, and mission speaker. A former Presbyterian pastor, he joined the Catholic Church in 2001 while studying for his doctorate at the University of Notre Dame. Dr. Bergsma has been featured regularly on Relevant Radio and has shared his conversion story with EWTN's The Journey Home. He is the author of Bible Basics for Catholics, Surprised by Scripture: How the Bible Made Me Catholic, and the newly-released (and sold out!) Introduction to the New Testament, co-written with Dr. Brant Pitre. He has many other books as well as countless audio and video recordings of his lectures. He also helps facilitate the amazing blog, The Sacred Page, along with Dr. Scott Hahn, Dr. Brant Pitre, & others, offering accessible and faithful reflections on the Sunday Mass readings as well as other articles concerning Catholicism & Scripture. Have you or someone you known felt that God might be calling them to become Catholic, or to come home to the Church if you've been away? The Rite of Christian Initiation for Adults (RCIA) is a beautiful gift from the Church for adults that are considering coming into the Faith or completing their Sacraments of Initiation (Baptism, Confirmation, Holy Communion) if they are already Catholic. Please consider joining us in this journey. Formal classes begin in September and run through the Feast of Pentecost (usually early June), but we're here year-round to answer any questions and help you begin the process! NOTE: We encourage any adult Catholic who wants to systematically (re-)learn their Faith to join us as well! 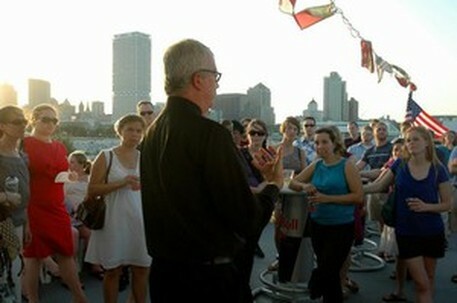 Photo from Lolek's Boating with the Bishop event. Each year on Divine Mercy Sunday we have a special Holy Hour with a national speaker, Confessions, Adoration, the singing of the Chaplet by Musica Oramus and an opportunity to venerate the Image of Divine Mercy along with relics of St. Faustina and St. John Paul II. The parish is also the Archdiocese of Milwaukee host site for the Franciscan Association of Divine Mercy formation group.